No more crap, let's get straight to the point. How to repair scratched DVD? Here below will show you the top solutions to fix DVD scuffs problem. Building on the different degree of DVD scratches, we provides you with the different solutions to repair damaged DVD disc, deep scratches or minor scrapes. Well now, let's remove scratches from DVD one by one. Part 1 - How to Repair Badly Scratched DVD Disc? Supposing your little naughty kid accidently makes deep scuffs on your favorite DVD disc, that means the deep scratches on DVD already cause harm to your DVD movie content, not merely the problem of DVD disc beautiful surface. So you would find it's just a futile effort to try the household methods to clean scratches from DVD. In such case, to ensure DVD movie smooth playback, you need an assistant to digitize your movies from DVD disc. To make a digital movie copy from the severely damaged DVD disc, MacX DVD Ripper Pro is the very helper you need. With powerful DVD self-repairing feature, this DVD copy software can read your DVD information successfully and automatically skip the bad sectors caused by deep scuffs to continue DVD movie copy journey. It treats your severely scratched DVD disc just like the common unwounded DVD disc and then copy DVD to ISO image for later DVD burning. What's better, it can also help you backup DVD with main/full title with all quality intact in 1:1 ratio. It shall be mentioned here some severely scratched DVDs come with bad sector, which is just the DVD copy protection scheme put in place by Sony, giving you an impression that your DVD is damaged. Any you can get MacX DVD Ripper Pro to deal with and repair the scratched bad-sector DVD, since it is equipped with a DVD decrypter that can get rid of the Sony ARccOS protection and bad sector hassle-free. 【Guide】How to Remove Deep Scratches from DVD for DVD Smooth Playback? 1 Free download this scratched DVD copy software on Mac or Windows PC. Launch it and then click "DVD Disc" button to import DVD disc. 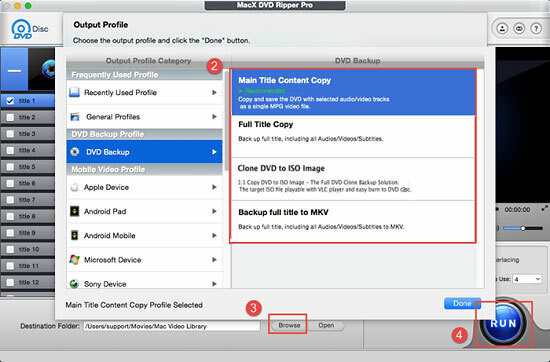 2Select the DVD movie backup mode from the pop-up window: Clone DVD to ISO image, Main title content/Full title copy, or backup full title to MKV. Make your choice. This DVD rip copy software also offers you up to 350 preset profiles for mobile devices, incl. copy damaged DVD to iPhone X/8/7/SE/6s/Plus, iPad Pro/mini 4, iPad Air 2, Samsung Galaxy S9, HTC, Surface Pro 4, Xbox One, PS4, etc. for playback DVD movies anywhere anytime. 3Specify the output path via the "Browse" button. 4Press on "RUN", and this DVD copy program will begin to repair badly scratched DVD and copy DVD movies to digital formats (MP4, MOV, AVI, MKV, FLV, etc. included). 1) During the DVD copy procedure, if the DVD ripper Mac/PC stops half way, for instance, stops at 40 mins (60 mins left), this means the severely scratched DVD has a bad sector here and now can't move on. In this case, you can use the DVD copy software's DVD movie editing feature to cut off the bad sector from the DVD movie and rip DVD to Mac/PC, hard drive etc. The icon with a pair of scissors and Edit is the one you need. 2) After you trim the DVD titles with different start time and end time, you are allowed to tick "Merger titles" option to merge the several movie titles into a complete one. 3) Tell you the truth, if the deep scratches have already ruined the *.IFO or *.BUP files, or both (DVD is consist of *.IFO, *.BUP and *.VOB), then you have no choice but to ditch away your DVD disc, for there is no machine or DVD backup software able to fix such severely damaged DVD. So you'd better backup new movies on DVD. 4) You can transfer the repaired DVD digital video files to iPhone iPad etc. for playback on the go with iTunes or MacX MediaTrans. The latter won't occupy you much time as it is able to transfer files in a fast speed within a few clicks. Part 2-How to Fix Slightly Scratched DVD Disc? DVD player not working happens as a result of the slightly damaged DVD. So look at your DVD, if not badly scratched, congratulations, you come to the world with easy easy tackle mode. Following part to repair slightly scratched DVD with home remedies without cost nary a nickle. 1. Slightly damaged DVD disc repair with a banana. 2. Get scratches out of DVD with peanut butter. 3. Make use of your toothpaste to clean scratched DVD. 4. Remove scuffs from DVD with vaseline or petroleum jelly. 5. 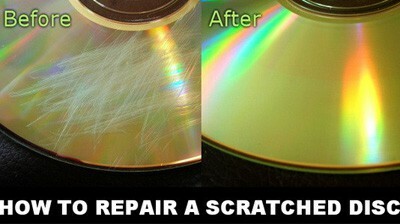 Repair scratched DVD with furniture polish, metal polish, etc. 6. Window cleaner & eye glass cleaner are also nice DVD scratch removers. Unable to play DVDs smoothly for scratches? Fix scratched DVD right now! This article introduces you top easy ways to remove scratches from DVD according to the degree of DVD damage. MacX DVD Ripper Pro is the fastest DVD copy software which can freely copy scratched DVD, remove any DVD protection and rip/convert any new copy-protected DVDs to various video formats (MP4, MOV, MKV, AVI, FLV, etc) and portable devices with original quality.